was almost top floor and the sun sure heated our unit up like a match box. there would be water puddles on the floor. Again I asked her, "Are you sure we don't need to empty it? She replied, "No, so I just mopped up the water over the hardwood and prayed nothing bad happened to the floor. Again, throughout the summer, puddles continued to be found. I then decided to try and find maybe a bucket or something where the water collected in the air conditioner could drain. No such luck. I needed a screw driver and I do not own one. "Hmmmm, it seems in the back that's where the water collects and then pools over onto floor." I decided to disconnect the air conditioner for we can live in the hot, but the floor seems to be bubbling and cracking. She then tells me this is my fault about the floor and how could I have been so stupid? I un-hook the air conditioner and she complains regularly it's too hot, screw the floor. The floor, over time, became worse and it happens to be in the dining room where the table is on the wood. It has popped up and cracked and the area is the size of a 4 person dining room table. My room mate decides then at the end of summer she will be leaving our lease. and she was the one who told me not to empty anything, and now she blames all on me. Some people are so disgusting. So, I have an air conditioner damaged wood floor. I have spoken to landlord regarding fixing and costs. He seems to think it's over 4300.00 because the hardwood was from Home Depot 5 years ago and also it can no longer be found? I have the model number, country of origin, description tag and am wondering if someone in the states would have it or what should I do??? I do not feel it is all my fault, but I'd like to try to come up with solution since my old room mate has decided to chicken out. without being taken advantage of. So with that being said, if the hardwood can't be found through its original maker, is it worth the effort to try different manufacturers or should all the floor just be replaced? why should I have to pay for the cost to replace all of the floor throughout the entire apartment when it is just that section? Thank you for the photos. That is very helpful. Wood floors are easy, roommates are not so. By floating, I mean the floor boards were joined to each other, but not to the sub-flooring under it. is discontinued in a short amount of time, for one reason or another. Furthermore, trying flooring from another mill to match this one is a waste of time. Even mills have trouble matching their own prefinished laminate hardwood flooring from lot to lot. It's great that you have the manufacturer's numbers. But, time is of the essence, here. 1. Take the Pledge. It's quick and easy and free. 2. Send Specifics. Get that information to me, exactly, and I will be happy to search the databases for available material. I also need to know the square footage. Only the air conditioner damaged wood floor needs to be removed, as long as matching material can be found. 3. Find Someone With a Moisture Meter. 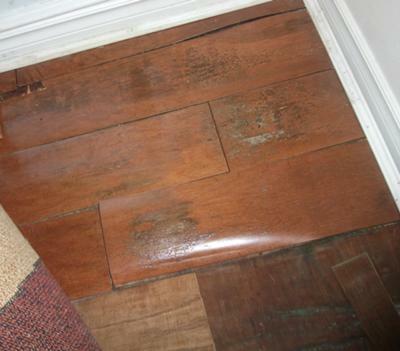 You also need to be certain that the subfloor is dry and back to normal before repairs are made. Otherwise, the floor will swell, again. An inspector will charge you. However, if there is a Floorwright in your area, his or her estimate is free, if you have taken the pledge, and a Floorwright is never without a moisture meter. 4. 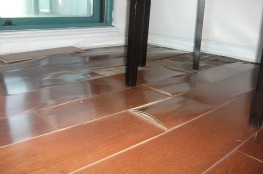 Please read all material on this site related to water damaged wood floor repair. in which I removed and re-used a discontinued product to make the repair. There are two or three videos you and your landlord should view, there, at my channel. It's not an air conditioner damaged wood floor starring in the video. In that case it was a water heater. But, see? You are in good company. to make this repair. So, I look forward to hearing from you and getting going on a reasonable solution for you and your landlord.